The location is only 10 minutes drive or so from Plitvice Lakes which was our main reason for staying. Our hosts were amazing, so helpful with good information which helped us beat the crowds at the lakes the following day. The accommodation was beautiful, clean, and peaceful. The attached restaurant was a bonus and the meal, drinks, and service were fantastic. I would not hesitate to recommend Etno Gardens. The only near hick-up for us was being early in the season there was no option to pay by credit card (cash only) which was not mentioned on Booking.com. This is apparently changing so check before you go. I would not say it a negative against the property purely because of the service and friendliness extended to us on our visit, but luckily we had cash on hand to cover it. The best thing about the hotel was how close it was to Lake Plitvice. In fact, the property borders the park. The breakfast offered was very good, although it did not come free. But being able to get a traditional American breakfast (with eggs!!!) was great, since breakfast does NOT seem to be the most important meal of the day in Croatia. Our host was really friendly and helpful, but I couldn't give Etno Apartments better than a so-so rating for check-in, because some buses had arrived just before we did, and the staff was preoccupied with them. One of the staff was kind enough to give us directions to the restaurant on the property, and we had a lovely dinner, while we waited for the crowd to be processed. Anyway, we would go back their again, because of the friendliness of the staff, the closeness to the Lake, the beauty of the surrounding property, and the attractiveness of the apartment. Wonderful host and staff. Comfortable accommodation. Good restaurant affiliated with accommodation. Close to National Park. Staff was incredible, every need met regardless how late we asked. Great beer and road/travel recommendations as well! Breakfast is fresh and delicious, rooms were comfortable, spacious and well equipped, and location is amazing. Secluded yet close to the park and scenic look out points. Cannot emphasize staff accommodation - we got in late and made multiple change requests about the stay/food, and each time; the staff was helpful and supportive throughout. Can’t wait to be back. Strong recommend!!!. The treatment of the staff was absolutely top notch and superb! We felt like royalty at every moment, from check-in to dinner to breakfast the next day. The general manager Tin is an excellent host and felt at home with his warm hospitality and great tips on visiting the park! We loved our apartment, the short walk to the Plitvice Lakes park and the food was INCREDIBLE- easily the best food we had during our entire time in Croatia. We highly recommend this place! Thanks for everything Tin! It was right on lake plvitice access. Just a short walk. They had a great breakfast. It's all about the location and friendliness of Tin, the staff guy. Large two+ room unit. Just a short walk to enter the park. The staff were wonderful and helpful. We were close to entrance 3 at the plitvice lakes national park. Lock in a great price for Etno Garden Apartments – rated 8.5 by recent guests! 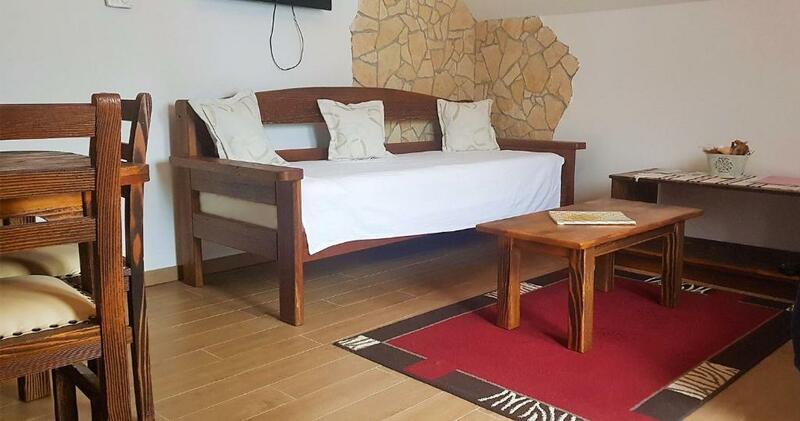 Etno Garden Apartments This rating is a reflection of how the property compares to the industry standard when it comes to price, facilities and services available. It's based on a self-evaluation by the property. Use this rating to help choose your stay! Enjoying a picturesque location only 1,300 feet from Lake Kozjak, the biggest lake of Plitvice Lakes National Park, the Etno Garden Apartments in Plitvice Selo are surrounded by a forest and lush meadows. Restaurant serves meals prepared with fresh locally sourced ingredients. All apartments consist of a kitchenette with a dining and a living area with satellite TV. Each features a bathroom with shower and a hairdryer. Leave your car on the parking lot and explore the national park - 0.6 mi from the property there is a magnificent waterfall. You can go hiking or enjoy a bicycle ride on the forest lanes. Your little ones will have fun on the wooden playground next to the Etno Garden Apartments. When would you like to stay at Etno Garden Apartments? This twin/double room has a soundproofing, sofa and satellite TV. We love meeting new people and look forward to their arrival on our property. We want them to bring the most beautiful memories from Plitvice lakes. House Rules Etno Garden Apartments takes special requests – add in the next step! Etno Garden Apartments accepts these cards and reserves the right to temporarily hold an amount prior to arrival. Please inform Etno Garden Apartments of your expected arrival time in advance. You can use the Special Requests box when booking, or contact the property directly using the contact details in your confirmation. Descent atmosphere & proximity to entrance No.3 of Plitvice National Park. The hotel gets a lot of tourist buses there, but with a tiny lobby area, the entrance gets quite congested at check-in and check-out. The bus people were fed in a different area, so we were able to dine in peace. I have to say that the staff seemed to take the crowds of people with professionalism. Just about everything else. The walls were paper thin. You could literally hear everything happening in the room next door. On the first night there was a woman screaming obscenities in the corridor. The communal restaurant was small, smelly and, not surprisingly, empty. It was also 200 metres away from the room up an unlit track. In my opinion this place should be avoided at all costs. Close to entrance to the park. Staff was amazing, they helped us with tickets and have us all the information. Breakfast was fresh, wide range of foods. For dinner we had portion of whole pig which was baking in open fire.. delicious! Overall, place worth staying in. Recently renovated modern accommodation with all the facilities required. Very attentive staff. Very close to P3 of the park, nice and friendly people. The apartment is very comfortable, clean and quit. The staff is super-gentle and very high skilled, a special mention to Yvana at the reception and the guys in the restaurant, who have made our stay very pleasant. The ETNO facilities are very closed to entrance n. 3 of Plitvice lakes ( the less touristic and less crowded ) - there's no ticket office at Entrance n. 3, but the hotel is helping you with tickets reservation and purchase. Very much suggested, especially in summer time, you can save a lot of time and avoid lines. Excellent food, worth to try local cheeses and lake trout. All the area around is far away from the mass tourism you can find in entrances 1 and 2, it's a tranquil and romantic location. I felt the overall price was a little high, but due to the location I can understand why it is the price it is. Great location for visiting the lakes. The hosts were very friendly and helpful and gave some good tips for visiting the lakes.